The recipe is listed below as well for convenience. 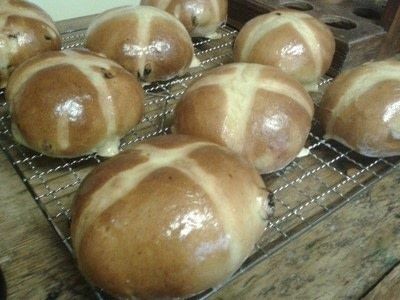 The buns will need to be made first. For the cross and the glaze please see below. First zest the orange and lemon. 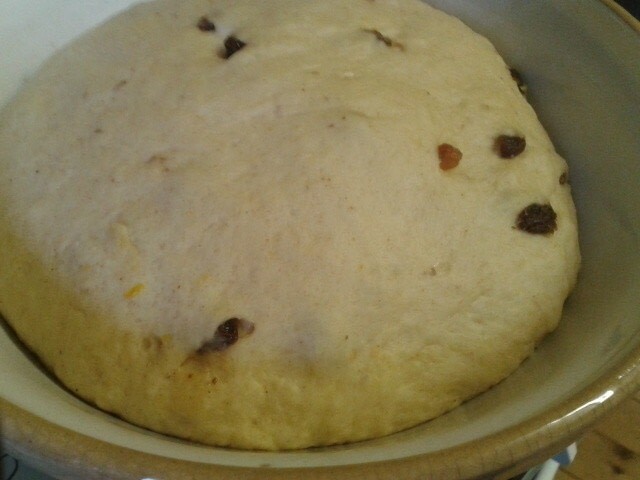 Weigh out the sultanas and raisins and put them in a bowl with the juice from the orange. Get the rest of the ingredients prepared. Measure out the milk and water, then dissolve the yeast in the mixture. Separately put the flours, salt and sugar in a bowl and pour in the milk/water/yeast mixture. Bring together with your fingers. Once it has come together it will be a slightly dry ball. 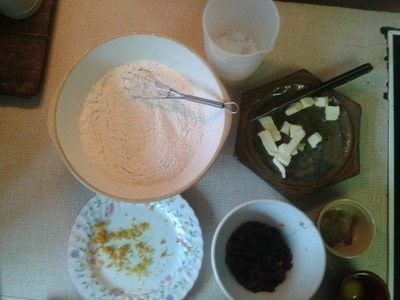 Add the other ‘wet’ ingredients, being the butter and the egg and knead in until combined. Once this comes together and the ‘flavour’ ingredients. First the spice and nutmeg, then the zests. Remove the currants and sultanas from the juice with a slotted spoon and add to the mixture and bring together. Knead on a well flour surface. 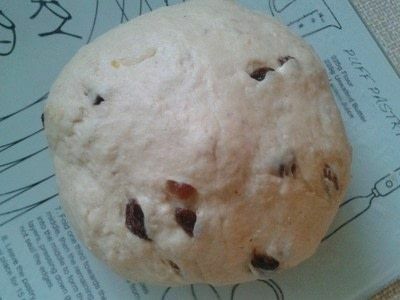 It will start off quite sticky but after about 10 minutes (maybe a little less) it becomes a silky smooth, workable, firmer dough. Shape into a ball, place in a clean bowl and cover with cling film. Leave for about 1 ½ - 2 hours or until doubled in size. When doubled in size gently fold out the air. 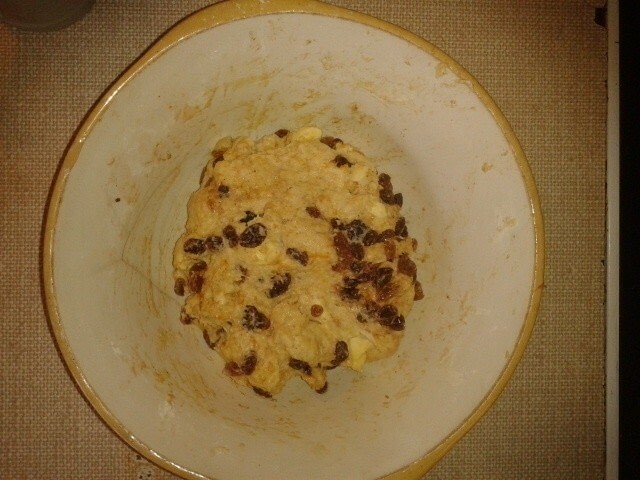 Divide into 8 (which will be about 125g each). 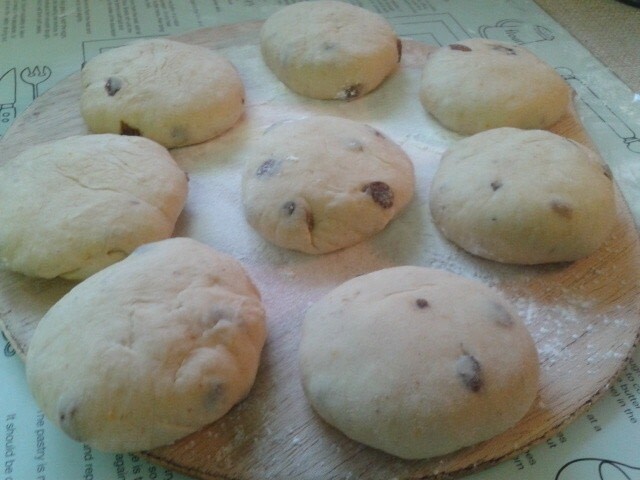 Shape into a smooth tight ball and place on a lightly flour surface. 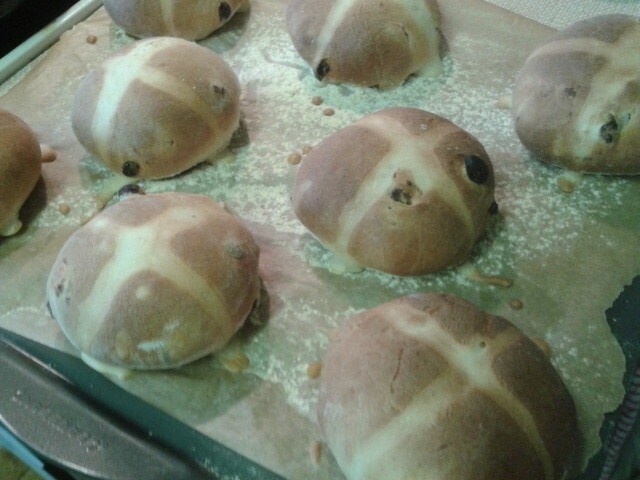 Cover with a tea towel and leave for about 45 minutes to rise. Pre-heat the oven to 200c. Line a baking try with greaseproof paper and put the buns on the tray to make the cross. Make the cross by mixing the flour and water together until smooth. Pipe a cross onto each bun and bake for about 12-15 minutes or until golden. Make the glaze 5 minutes before the end of cooking. Dissolve the jam and water together but do not allow boil. Once dissolved strain the mixture through a sieve into a small bowl. Once the buns are baked glaze each one with the jam mixture. Once all are glazed give a second coat and make sure the whole of tops are covered. Leave too cool. Best served toasted under the grill and buttered.